Mineral resource assessments integrate and synthesize available information as a basis for estimating the location, quality, and quantity of undiscovered mineral resources. 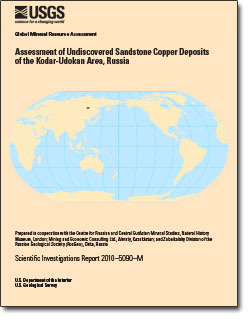 This probabilistic mineral resource assessment of undiscovered sandstone copper deposits within Paleoproterozoic metasedimentary rocks of the Kodar-Udokan area in Russia is a contribution to a global assessment led by the U.S. Geological Survey (USGS). The purposes of this study are to (1) delineate permissive areas (tracts) to indicate where undiscovered sandstone-hosted copper deposits may occur within 2 km of the surface, (2) provide a database of known sandstone copper deposits and significant prospects, (3) estimate numbers of undiscovered deposits within these permissive tracts at several levels of confidence, and (4) provide probabilistic estimates of amounts of copper (Cu) and mineralized rock that could be contained in undiscovered deposits within each tract. The workshop for the assessment, held in October 2009, used a three-part form of mineral resource assessment as described by Singer (1993) and Singer and Menzie (2010). Permissive tracts were delineated by estimating the volume of rock that contains the stratigraphic section ranging from the Chitkanda to the Sakukan Formations of the Udokan Complex to a depth of 2 km and then projecting this rock volume to the surface. The six permissive tracts delineated in this assessment occur in several domains, referred to as troughs in Russian literature, which represent remnants of a much larger basin that likely covered the Kodar-Udokan region. Tracts range in size from about 100 km2 to 800 km2. The mapped distributions of rocks as shown on 1:200,000-scale geologic maps, supplemented in some areas by prospect mapping and drilling, were used to delineate the tracts. In this study area, data are insufficient to constrain the original basin geometry or the structural or stratigraphic traps that would have localized copper mineralization. Some alteration is described, and the types of sandstone cements vary; however, no patterns are known that provide evidence for regional flow paths of metal-bearing brines that could localize deposits. This probabilistic assessment indicates that a significant amount of undiscovered copper is associated with sediment-hosted stratabound copper deposits in the Kodar-Udokan Trough. In the assessment, a mean of 21 undiscovered deposits is estimated to occur within the Kodar-Udokan area. There are two known deposits in the area that contain drill-identified resources of 19.6 million metric tons of copper. Using Monte Carlo simulation, probabilistic estimates of the numbers of undiscovered sandstone copper deposits for these tracts were combined with tonnage and grade distributions of sandstone copper deposits to forecast an arithmetic mean of 20.6 million metric tons of undiscovered copper. Significant value can be expected from associated metals, particularly silver. Zientek, M.L., Chechetkin, V.S., Parks, H.L., Box, S.E., Briggs, D.A., Cossette, P.M., Dolgopolova, A., Hayes, T.S., Seltmann, R., Syusyura, B., Taylor, C.D., and Wintzer, N.E., 2014, Assessment of undiscovered sandstone copper deposits of the Kodar-Udokan area, Russia: U.S. Geological Survey Scientific Investigations Report 2010–5090–M, 129 p. and spatial data, http://dx.doi.org/10.3133/sir20105090M.